Throughout the preseason the Buffalo Bills quarterback situation looked better than was first anticipated. All three of the Bills quarterbacks (Nathan Peterman, A.J. McCarron and Josh Allen) had their moments and it seemed to have gotten to a point that there was an actual competition for the starting job. After a strong showing by Allen last week against the Cleveland Browns, there were many who felt that Allen may actually be the starter for the Bills on opening day in two weeks. Much of that talk came to a halt following Sunday’s poor play versus the Cincinnati Bengals. Allen had a rough day, completing just six of 12 throws for 34 yards and got sacked a whopping five times in a half of play. He looked like an inexperienced rookie starting his first game. In that same Cleveland game McCarron suffered a shoulder injury that was thought to be more serious than it actually was. Still, he was unable to play yesterday and so Allen and Peterman split time with each playing a half. That brings us to Peterman, who in my opinion has played the best and most consistent of the Bills three quarterbacks this summer. 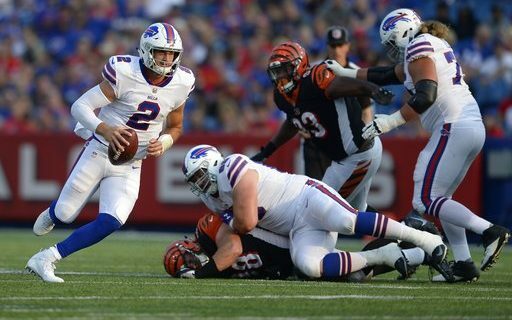 Against Cincinnati, while playing with the Bills second and third team players, Peterman completed 16 of 21 throws for 200 yards and a touchdown. For the three preseason games to date, Nathan is 33 of 41 for 431 yards, 3 TD’s and one interception. His completion percentage is 80.4%, not too shabby considering he hasn’t played with the offensive starters since the opening preseason game against Carolina. In fairness, McCarron has looked fairly good also but he hasn’t been as decisive nor as productive as Peterman was in the two games he played. Hurting his shoulder certainly set him back some but regardless, the numbers speak for themselves and Peterman has been the best and most productive quarterback. I’m not taking anything away from Allen. For a rookie he has played well (except yesterday) and he IS the future for the Bills. But to have him start off the season against the Ravens, Chargers, Vikings and Packers could do more harm than good. I feel Allen will become a very good NFL quarterback but he isn’t ready to be a starter just yet. All we need to do is look at yesterday’s game to know that. While the offensive line didn’t help him, his indecisiveness in regards to decision making didn’t help the cause. In the 2016 and 2017 Drafts, the first quarterbacks selected were Jared Goff in 2016 and Mitch Trubisky in 2017. Neither was a game one starter as a rookie. Goff didn’t start until game nine and Trubisky got his first start in game five. Even after waiting a half season before he got to play, Goff still struggled and some were saying he was going to be a bust. Being that I live in Chicago now and cover the Bears I saw all of Trubisky’s games as a rookie both in the preseason and the regular season. He clearly beat out veteran Mike Glennon in the preseason but he still wasn’t ready to start a regular season game that early in his career. He needed to sit and learn for a while. Who’s the Week One Starter? The same holds true for Allen. He has a lot of upside but until he is ready to play it does the Bills and Allen no good to start him before he is ready. I have no doubt that Allen will be the Bills starter sometime before the end of the 2018 season. But it’s my hope that we don’t see it happen until November, not September. As of right now, Nathan Peterman gives the Bills the best chance to compete to win in the early games of this season.